After the FX2-Dominator review, we are back with another AKK FPV transmitter review. Contrary to its much powerful brother, the AKK Race VTX is suitable for low profile racing drones, where space is critical. In addition to the ultra-thin design, it comes with lots of cool features and friendly price tag. Speaking from my own experience, when it comes to building your own FPV drone it is very important to find the right part for the job at the lowest price possible. 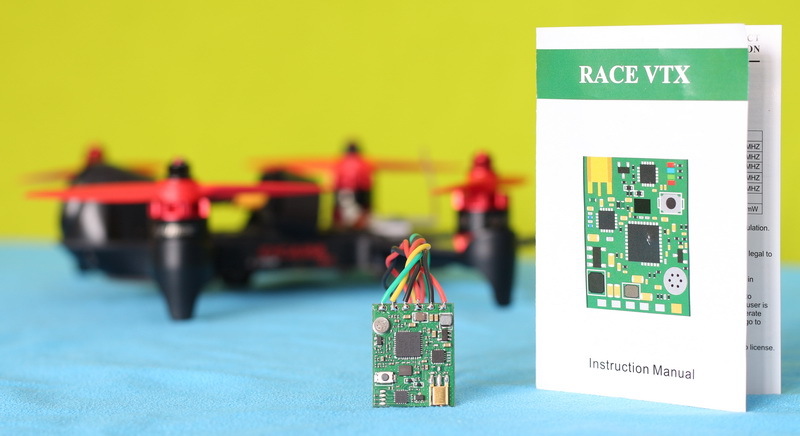 For example, if you want to built a 100 bucks racing drone, you will not afford to pay half of the project’s budged only for an ultra high-end VTX. Also, if you need a super thin video transmitter, you will skip over the ones with heat-sink and status LCD. Of course, besides price and form factor, transmission power and other features are important as well. Optional SMA or RP-SMA plug. Disclosure: I received this 5.8G video transmitter as part of a product review collaboration with AKK Tech. Although the VTX was offered for free, all thoughts in this article remain my own and I was in no way influenced by the sponsor. I received the AKK Race VTX about two weeks ago together with the previously mentioned FX2-Dominator. In order to keep the product price as low as possible, it comes only in anti-static bag, instead of the usual AKK box. Besides the VTX module, the bag contains a MMCX antenna pigtail and a tiny user manual. The module itself measures 20 x 25 mm and has a max height of just 3.5 mm. Practically can’t be achieved a thinner VTX due to the thickness of the MMCX connector. All the electronic parts, including control button, status indicators and microphone, are on the front part. From up to down you have the following LEDs: Band indicator, Channel indicator, Power/25mW and Power/200mW. The module comes with pre-soldered wires (about 8cm long). You have black and red wires for power input, respectively green for TBS, yellow for Video-IN, black for camera GND and red for camera power. As there are no mounting holes you will need some double-sided tape or zip-ties to install the AKK RaceVTX onto your drone. The AKK Race VTX features dual power mode. According to your needs, you can toggle between 25mW and 200mW power, thanks to TBS SmartAudio even remotely via BetaFlight OSD. From the possible 40th transmission channels (8 channels x 5 bands), due to FCC regulations, only 37CH can be set (E4, E7 and E8 are disabled). At the time I’m publishing my review, the AKK Race VTX is listed on manufacturer’s website for only $9.99. According to your antenna connector, you have two options: SMA or RP-SMA version. Overall, I liked the AKK Race VTX. It is a super cheap, light and thin FPV transmitter. It has built-in microphone, status LEDs and TBS SmartAudio. My only complain is regarding the input voltage. Cannot be powered directly from the main battery. It accepts 5V only. Lots of features (SmartAudio, Adjustable Power and On-board microphone).